Dr. Hy joined Cao Thang Eye Hospital in 2009 and is currently the Head of Cataract surgery. A specialist in cataract surgery, Dr. Hy is training to become a LASIK surgeon. He is responsible to Cao Thang Eye Hospital's biometry department. 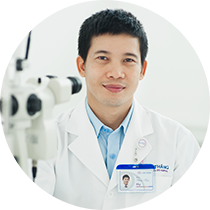 Prior to joining Cao Thang Eye Hospital in 2009, Dr. Hy worked at the Department of Ophthalmology at Hong Duc Hospital, and also at the HCM Eye Hospital. During his professional practice he has participated in diagnosis, investigation and treatment of outpatients and in-patients for cataract, glaucoma, strabismus, corneal, orbital, retinal. Dr. Hy received both his Degree in Medicine andSpecialist Level I in Ophthalmology from the Ho Chi Minh City University of Medicine and Pharmacy, in 2005 and 2009, respectively. He has obtained a number of certificates and trainings as part of his professional development. He has a Certificate of Appreciation of Flying Eye Hospital (ORBIS), Phacoemulsification Technique in Cataract surgery at HCMC Eye Hospital in 2010, Ultrasound from HCM Eye Hospital in 2015, LASIK technique from the HCM Eye Hospital in 2015. Certificate on Descemet-stripping lamellar endokeratoplasty (DSEK) and deep anterior lamellar keratoplasty (DALK), innovative corneal implant, Ho Chi Minh City Eye Hospital, 2017. Dr. Hy is a member of the Vietnam Ophthalmological Society. • Updates about new Phaco technique (torsional) Conference, HCMC, Vietnam. • Article:Compare two multifocal lenses, AcrysoftRestor and ReZoom,HCMC, Vietnam. • Updates about new Glaucoma, AMD treatment Conference, Hue, Vietnam. • Annual National Meeting of Vietnam Ophthalmological Society (VOS). • APAO 2012 and 2014 Conference, Busan, Korea.